Whether you’re looking for an outdoor space for family and friends to gather, or an outdoor retreat to relax in after a long week, or any combination of the two, we’ll create an attractive and functional space that you’ll fall in love with. With years of experience in the landscaping industry, you can rest assured that Sculptured Grounds’ professional team will be dedicated to creating a yard that you’ll want to show off! With an uncompromised commitment to excellence, at Sculptured Grounds we’re focused on always exceeding your expectations. From pre-planning and design to the finishing touches, we always focus on individualized service, so that you’ll know exactly what we’re working on and how things are going. We know that an informed client is almost always a happy client. Our team doesn’t consider any job completed until you are completely happy with the finished product. From outdoor fireplaces and pool decking to artificial turf and water features, there’s no hardscape or landscaping project too big or too small for the professional team at Sculptured Grounds. Regardless of whether your style is relaxed and laid back or elegant and stylish, or any combination, we’ll work with you to create a plan and a design that works for you. With a wide range of knowledge and years of experience, you’ll know that we’ll create an outdoor oasis of your dreams. Our mission is to design and construct timeless outdoor living spaces that homeowners and their families can enjoy for years to come. 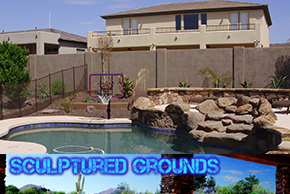 For any of your landscaping or hardscape needs in the Chandler, AZ area, contact the professional craftsmen at Sculptured Grounds today! We guarantee we won’t consider your project complete until you are 100% satisfied with the way it looks and feels.